Skibbereen Theatre Society emerged top of the four entrants in the confined section to win at the 50th West Cork Drama Festival with the bittersweet Frank Vickery comedy A Kiss on the Bottom, while Carmel O’Driscoll was once again awarded best actress and the group also won the overall prize for best set. They finished second at the North Cork Drama Festival in Charleville, where Carmel O’Driscoll also won the best actress award. With three festival results still to come, they now have just about enough points gained on the festival circuit to earn them a place in the All-Ireland confined finals, which will be held at the Wexford Opera House the second week of April. 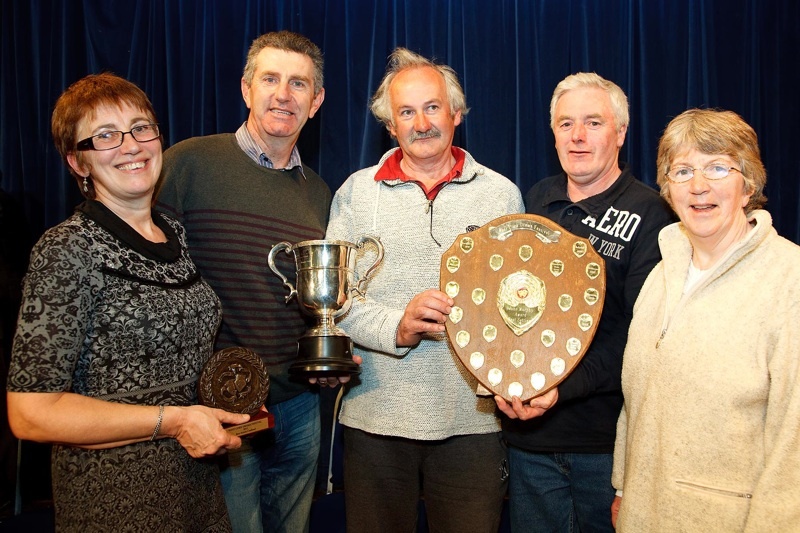 Skibbereen Theatre Society won the confined section at the 50th West Cork Drama Festival in Rossmore with the comedy A Kiss on the Bottom by Frank Vickery. Pictured, from left, are Carmel O’Driscoll, best actress; Fachtna O’Driscoll, director; Con Minihane, set builder, with the award for best set; Cel Loughran and Mary Minihane.